Baby Gumm Productions is pleased to present the premiere of their Film Discussion Series. 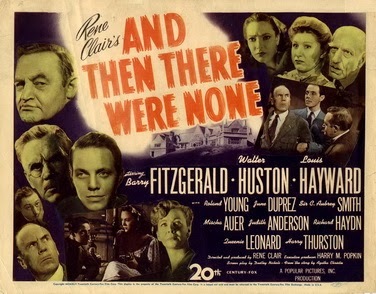 The first movie featured in the series is the 1945 version of Agatha Christie's classic whodunit, And Then There Were None. Enjoy this suspenseful mystery on the big screen and join us afterwards for an open discussion on the film and the Queen of Crime with Dr. Glenwood Irons, editor of Feminism in Women's Detective Fiction. Darren Stewart-Jones is a director, theatre producer and member of the Playwrights Guild of Canada. Through Baby Gumm Productions, he has produced plays at Buddies In Bad Times Theatre, Toronto Fringe, Hamilton Fringe and the London One Act Festival. Darren directed the fabulous Elley-Ray Hennessy in his Judy Garland docudrama, The Judy Monologues. He also recently hosted A Chat With Sheila McCarthy, a live conversation with the multi award winning Canadian actress. Darren is Artistic Director of both the HamilTEN Festival, a festival of 10 minute plays in Hamilton and Gay Play Day, a festival of LGBTQ theatre in Toronto. His plays include Sherlock & Watson: Behind Closed Doors and Emerald City - A musical play.